Jalen Dearring, senior, makes an athletic move towards the basket in the semi-final. The Royals take on Lakeville North in the championship game this Saturday. 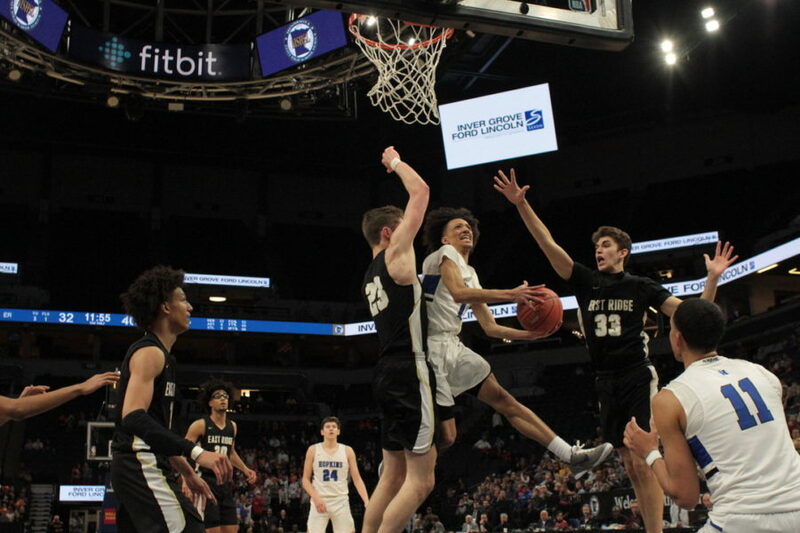 Hopkins faced off against the East Ridge Raptors in the state semi-final, the Raptors took a commanding victory over Eastview in their quarter-final matchup with a final score of 78-41. The Royals picked up right where they left off in their last game, playing fantastic defense. Though this game would not see Hopkins have as much ease scoring as they did in their contest against the Bluejackets, the Royals got into a rhythm. Given the size of both teams, this game was very physical, the referees let them play on in many different instances. Lots of stellar defense from both teams caused neither squad to shoot over 45 percent from the field during the first half. The Royals held East Ridge to 24 points in the first half which is eight points less than the Raptors scored against Eastview. Though both teams played great defense, lots of ball movement on the offensive end led to a large amount of the points scored in the first half. The leading scorer for the Raptors through the first half was senior guard Patrick Lynott with six, and the Royals leader was senior forward Zeke Nnaji, with 13 points. The length of the Royals caused lots of missed shots through the first, the Raptors shot 35 percent from the field. Though they were missing many shots around the floor, East Ridge was leading the Royals in three point percentage with 44 percent to the Royals 33 percent. The Raptors student section used the ‘overrated’ chant towards Nnaji early in the first half which caused him to want to take over. Nnaji would go on to lead the Royals in scoring with a total of 23 points. The momentum wasn’t swinging in either direction going into the second half with only a two point deficit. The Royals opened up the second half with a 12-4 run to stretch their lead to 10. Jalen Dearring, senior, made two straight baskets after Kerwin Walton, junior, made an easy lay to start that run for the royals. After Hopkins’ early string of baskets, the Raptors just could not equalize like they did in the first half. A few nice three pointers from some of their stars seemed to give East Ridge some momentum but every time they scored, Hopkins had an answer. Going into the second period, Nnaji was the only royal with over 10 points, but with four and a half minutes left, the Royals had three of their other starters hit double digits in scoring. With just over four minutes left, sophomore, Kendall Brown (East Ridge), lifted off for a dunk that saw him nearly meet the rim with his eyes. Though that was great highlight, the Royals were ahead 16 points. Andy Stafford, senior, was leading the charge on a fast break with a little over three minutes to go, and threw down a crowd-firing right hand slam. With just over two minutes left, the Royals student section started the chants that meant the game was over, ‘start the busses’ and ‘beat the traffic’. As the Lindbergh Loonies sang goodbye to the Raptors, one by one, little by little, every East Ridge fan tried to beat the traffic. With around a minute and a half left, Dane Zimmer, senior, whipped a bounce pass into Nnaji for his final basket of the game. Zimmer had a fantastic impact on the Raptors in this matchup, with 13 rebounds, three steals, and two blocks, Zimmer was the Royals anchor on the defensive end. Nnaji and Zimmer combined for 23 rebounds which was four less than the Raptors had in total. The Royals will take on the Lakeville North Panthers who upset the Park Center Pirates right before this matchup. Hopkins will play in the state final on Mar. 23 at 8:00 pm.